Industrial robots are at the forefront among the technologies of the Industry 4.0 revolution. Although industrial robots have been in use since the 1960s, recent years have brought significant change. Their functionality has improved considerably, prices have declined, and the industry has gained strong policy support. Going forward, population ageing is also expected to bolster growth. As a result, industrial robots are being applied in a variety of industries beyond the traditional automotive sector. The global industrial robotics market was worth USD 41.9 billion in 2017 (about 22% of the global factory automation market) and is forecast to reach USD 73.5 billion through 2023E at a CAGR of 9.8% (with unit sales to record a 13.4% CAGR over 2017–21E). The Asia-Pacific region, led by China, was the largest market for industrial robots as of 2017, while Japan dominated global supply. Nonetheless, rapid growth in the number of investment deals in the USA and China is shifting global production share away from Japan. In this regard, the USA has a clear edge over China, where technological development remains challenged by weak intellectual property protection. This has paved the way for a new wave of M&A between Chinese corporates and US and European developers of Industry 4.0 applications. 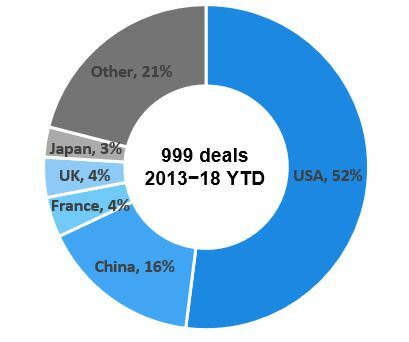 Globally, deals have focused on three key themes: the integration of artificial intelligence (AI) with industrial robots, the adoption of robotics by small and medium-sized enterprises (SMEs), and an increase in funding from corporate venture capital for start-ups in industrial robotics. The world’s first industrial robot was introduced by George Devol in the 1960s. Since then, the functionality of industrial robots has improved significantly. However, their application has been limited to a few large firms, mostly in the automotive industry in Japan and the USA. The market has therefore been limited and less developed until a recent pickup in 2012 across the globe. Over 2012–17, global demand for robots grew at a CAGR of 19.1% compared with a CAGR of 6.9% over 2007–12. The global industrial robotics market is today worth as much as USD 41.9 billion (as of 2017), i.e. approximately 22% of the global factory automation market. One of the main reasons for the recent boom in industrial robotics is the implementation of supporting policies by many governments including Europe’s and China’s. Coupled with this, wider acceptance of Industry 4.0 applications has led to an increase in R&D and also improved performance of sensors, battery storage, and microprocessors. This has helped improve functionality and the cost of industrial robots, making them a preferred option versus labour and outsourcing. According to Boston Consulting Group (BCG), the average cost of industrial robots declined almost 54% to USD 31,312 in 2014 from 2005. 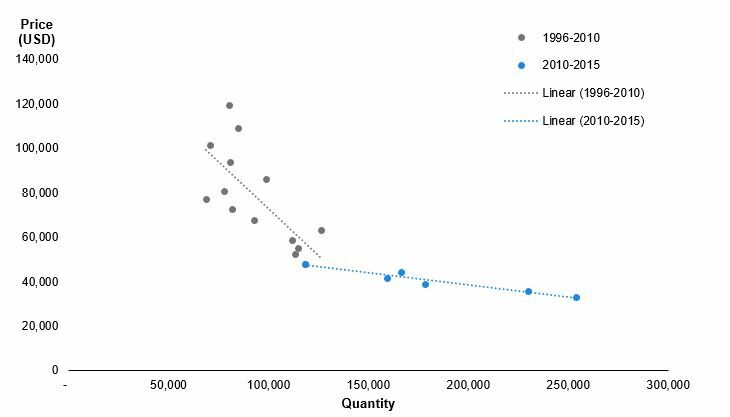 Moreover, according to the same source, demand for industrial robots has become more price-elastic (sensitive to price changes). A minor decline in price can trigger rapid growth in demand. For industrial economies such as the USA and Germany, the aforementioned underlying trends in the industrial robots market present an opportunity to improve their manufacturing competitiveness . In China, the focus is rather on sustaining manufacturing leadership (which drives its economic health) amidst wage inflation. Annual average manufacturing wages in China increased 55% over 2012–17, and this likely pushed China to rethink its manufacturing model. As a result, China welcomed Industry 4.0, for which industrial robots provide vital support. Moreover, China has become the leading market for industrial robots, accounting for 35.7% of global demand in 2017 and 48.3% of the increase in global demand over 2013−17 (however, China was a late entrant to industrial automation, given the country’s industrial robot density [defined as robots per 100 manufacturing employees] of 0.68 in 2016, below the global average of 0.74). 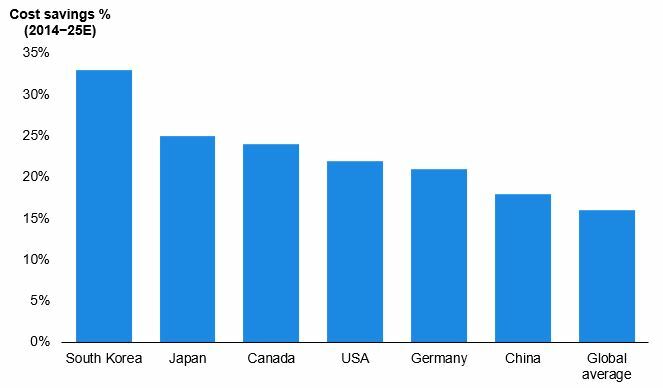 In terms of market size, South Korea and Japan ranked as the second- and the third-largest markets for industrial robots, behind China, while the USA ranked fourth. 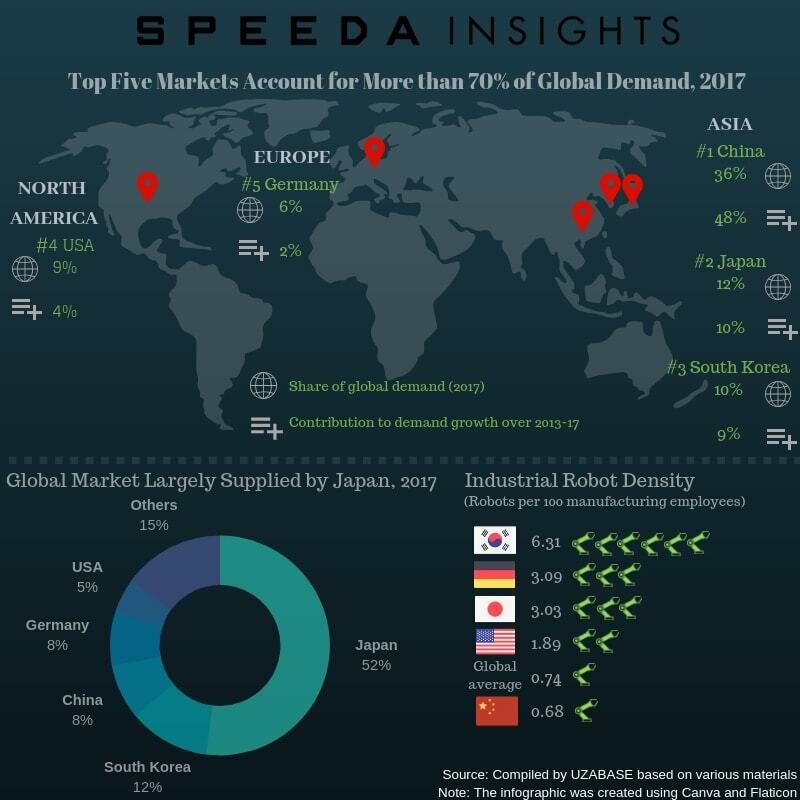 In terms of cumulative demand, the Asia-Pacific therefore dominates the industrial robots market as a region, while Europe ranked second (17.3% of global demand), and North America third (12.9%). In terms of applications, since the introduction of the world’s first industrial robot, the automotive industry has been the main market for robotics developers. Even as of 2017, close to 33% of industrial robotics installations were in the automotive industry. 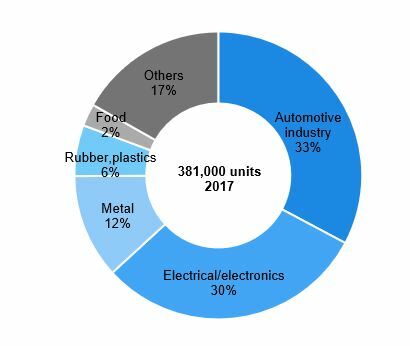 However, in terms of contribution to growth in demand over 2013−17, the electrical/electronics industry accounted for 33.1%, ahead of the automotive industry (23.0%). From a supply point of view, the production of industrial robots has been largely concentrated in a few countries, with Japan playing a prominent role. Japan produced close to 52% of the world’s industrial robots in 2016, followed by South Korea (12%) and Germany (8%), who are also the leading net exporters. Even though the USA and China also accounted for shares of around 5% and 8% of global supply respectively, the two were large net importers, with dependencies of close to 52% and 70% of total sales respectively in 2016. There has been heavy investment in industrial robotics across the world in order to capture rapidly accelerating demand. 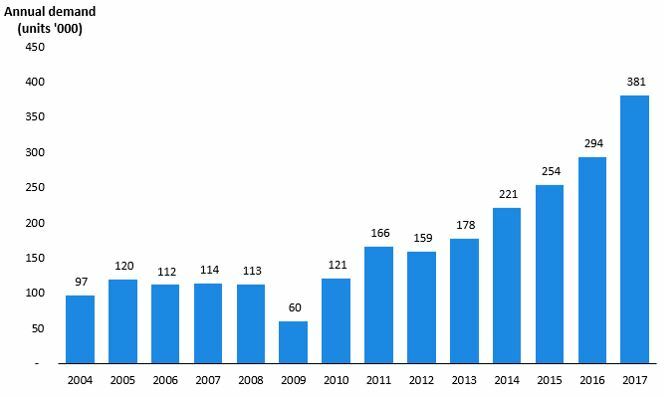 Globally disclosed funding in the industry has increased at a CAGR of 68.0% over 2013–17 to USD 2.1 billion from a low of about USD 259 million. This was a result of a 4x increase in the total number of deals over the same period to 245 deals in 2017. Average funding per deal also rose to USD 8.4 million in 2017 from USD 4.7 million in 2013. 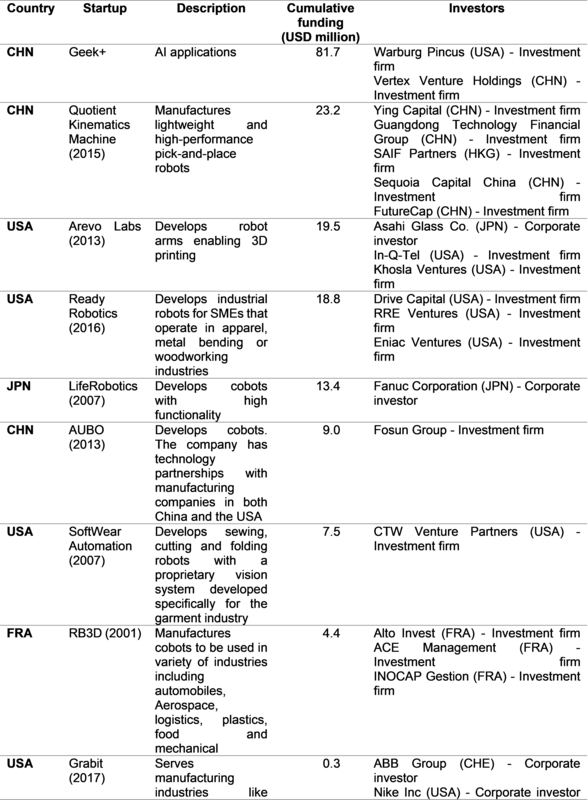 Further, disclosed funding reached USD 2.5 billion in YTD 2018 and target funding USD 0.8 billion, indicating continued investment. Even though Japan is the leading manufacturing hub for industrial robots, more than half (about 52%) of the investment deals in industrial robots over 2013−18 YTD was in the USA, followed by China (16%). This shows a likely production shift away from Japan to the USA and China, but not to an extent that could cause a significant change in Japan’s dominance, given the slow maturity of investments, in our view. 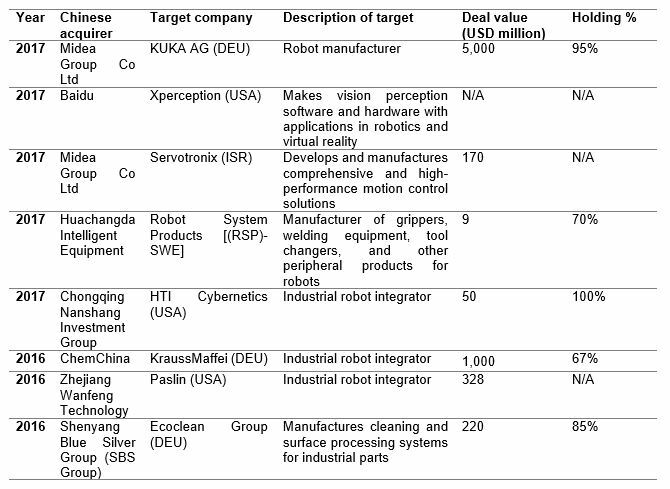 There is strong regulatory support in both the USA and China to develop industrial robots in-house. However, a key reason the USA received a higher percentage of investment was its well-established R&D base, supported by strong intellectual property (IP) protection. Thus, the USA’s popularity as a technological hub, with strong links to Silicon Valley, gives the country a clear edge to attract investments in a revolutionising industry. According to many industrial experts, industrial robots currently manufactured in China are of those with traditional functionalities, with a minimal application of novel technologies such as artificial intelligence (AI) and virtual reality (VR). Nevertheless, China remains a preferred country for investment in industrial robots, given its well-established, low-cost manufacturing industry. Increased M&As between Chinese corporates and foreign industrial robotic companies in China is proof of this. The global industrial robotics market is expected to reach USD 73.5 billion through 2023E, supported by strong investment flows, registering a CAGR of 9.8% over 2017–23E, according to Statista based on Business Wire. This should be underpinned by stronger growth in unit demand for industrial robots, which is expected to grow at a CAGR 13.4% over 2017–21E to 630,000 units, according to IFR. Close to 83% of this growth will be contributed by the Asia-Pacific region, led by China (which is expected to contribute close to 63% of the growth in global demand). According to industrial experts, several factors should drive industry demand, including the ageing of the labour force, a reduction in the cost of robots due to improved tech infrastructure, and a stronger drive for AI adoption. Robotics offers a solution for sustaining manufacturing output in the face of the problem of population ageing. The aged population is expected to reach 2.1 billion globally by 2050E (21.4% of the total global population in 2050E), compared with an aged population of 0.9 billion globally (12.2% of the total global population) as of 2015 (revised in 2017). China is expected to account for 22.0% of this increase, as the country with the most aged population. Secondly, according to BCG estimates, the cost of an industrial robot is expected to fall 20% by 2025E compared with 2014. 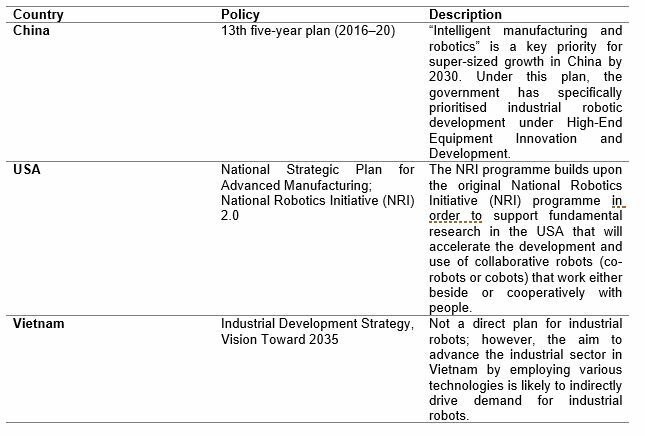 BCG also estimates that countries such as South Korea, Japan, the USA, Germany, and China will make the most substantial cost savings through the use of industrial robots by 2025E (China is a low-cost manufacturing hub relative to other industrial economies, and its cost saving rate is therefore relatively low compared with others’). Another current highlight in the industry is the rapid growth in ASEAN manufacturing. Excluding Singapore, the region is new to Industry 4.0 applications including industrial robots. However, ASEAN presents a hub with high manufacturing potential due to strong government support for the development of the regional manufacturing sector as well as the prevalence of low industrial wages. Even though demand from the region has not been continuous, in 2017, Vietnam and Thailand respectively ranked among the top ten markets for industrial robots. Moreover, many of the top robotic companies such as ABB, Fanuc, and Universal Robots (UR) have already set up operations in the region. 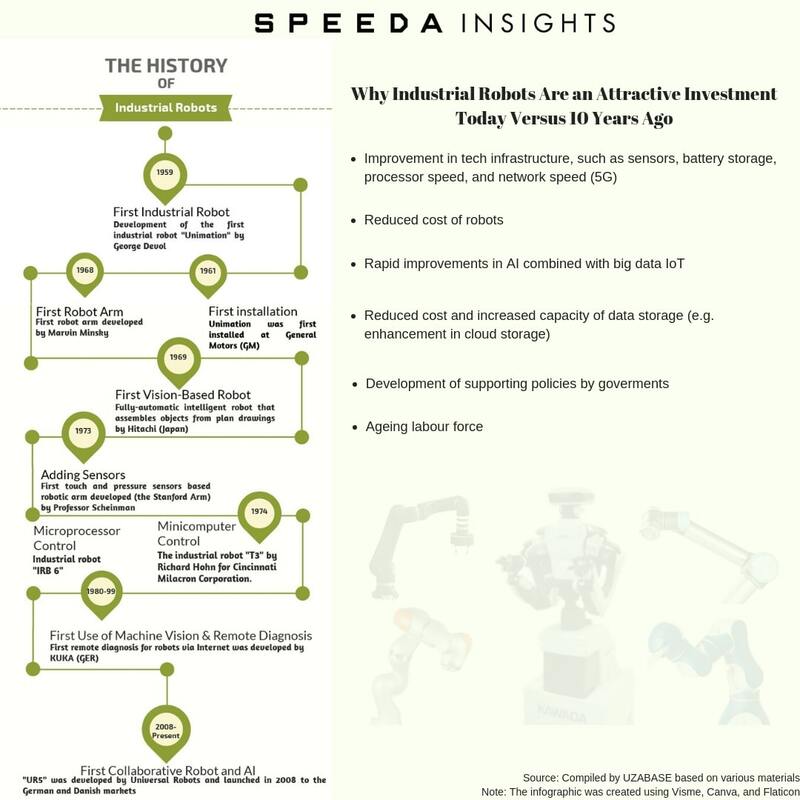 In addition to the above-mentioned strong outlook for top-line growth, we identify three main trends that are further shaping the industrial robots industry. 01. Emergence of new start-ups that integrate AI and industrial robotics: Although the AI industry remains at a nascent stage, it has global attention from investors due to its strong potential. The global AI industry is projected to grow at a significant CAGR of 51.7% over 2016–25E to USD 59.7 billion in 2025E (approximately 7% of global IT spend by 2025E), as per Statista. Even though large corporates dominate the industrial robots industry, new start-ups have emerged via the integration of AI and industrial robotics. 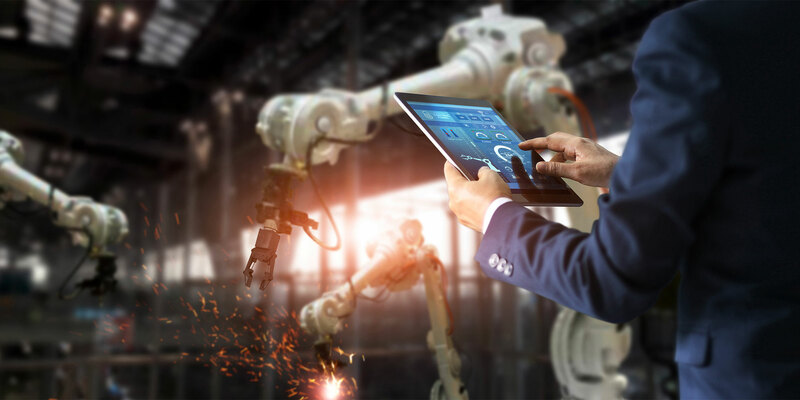 Current applications of AI in industrial robotics is in a stage known as artificial narrow intelligence (ANI) — the foundational stage — where systems can manage only one function. However, the transition to the next phase — artificial general intelligence (AGI), which incorporates machine learning — has already been initiated; one instance is KUKA’s development of self-learning robots. In the current wave of AI development, corporates are thus investing in new start-ups in order to introduce novel technologies. 02. Use of industrial robots in SMEs: Alongside demand from new industries, an entirely new segment of businesses is also generating demand for industrial robots: small and medium-sized enterprises (SMEs). SMEs on average account for 70% of the world’s manufacturing, but adoption of robots has been restrained due to the high cost of set up, amidst a lack of expertise, a lack of flexibility, and the scale of operations (relatively small for the capacity of robots currently in use). In other words, SMEs typically involve shorter batches, smaller production series, and more process variation, all of which present a challenge in the application of structured robots with mass capacity. Moreover, for a long time, there has been no regulatory support for SMEs to automate manufacturing. However, the EU has taken initial steps in this regard. 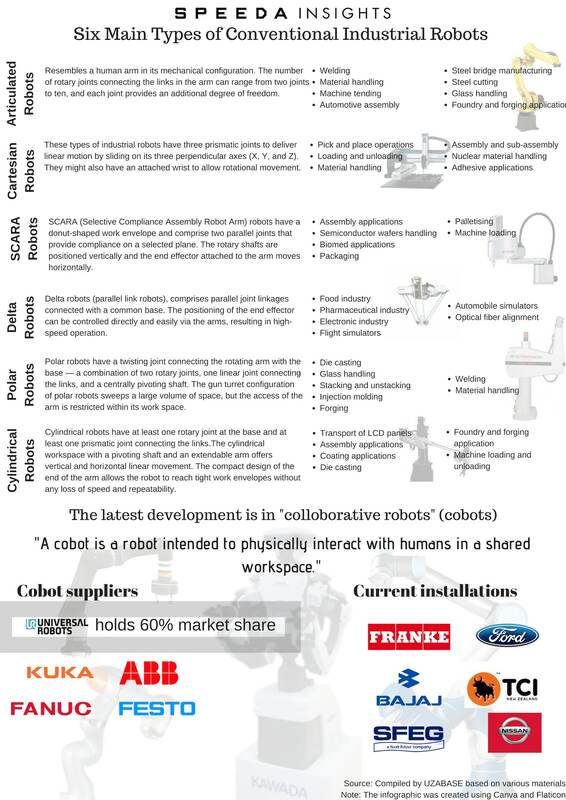 The SMErobot™ programme (2005−09) and the SMErobotics™ programme (2012−15) are research projects launched by the EU to encourage manufacturing SMEs’ use of robotics. The programmes developed and demonstrated affordable, modular, and interactive robots that are easy to install and operate. Since then, a few start-ups have emerged to cater to the segment. 03. Start-ups in industrial robots industry gaining attention from corporate venture capital: Even though such start-ups remain largely funded by investment firms, there has been increasing interest from corporate venture capital over the recent years. 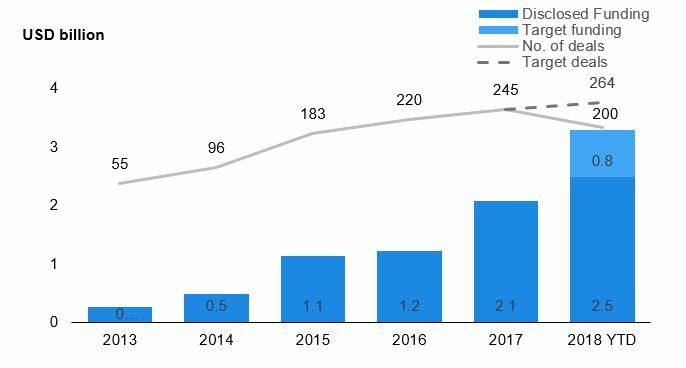 Corporates were involved in close to 30% of deals in robotics in 2017, more than double their share of 13% in 2013. Companies often are thus showing active interest in start-ups in new tech such as AI in order to broaden their portfolio of applications.